Capt. John C. "Jack" Lee, Jr. The French prisoners included former prime ministers, generals and a tennis star. It is the only known time during the war in which Americans and Germans fought side-by-side. Popular accounts of the battle have called it the strangest battle of World War II. ^ Nutter, Thomas (23 April 2013). "The Last Battle: When U.S. and German Soldiers Joined Forces in the Waning Hours of World War II in Europe". New York Journal of Books. Retrieved 27 July 2013. 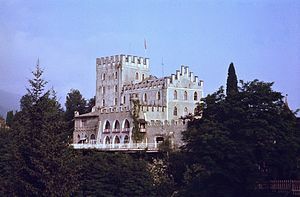 ^ a b "The Austrian castle where Nazis lost to German-US force". BBC News. ^ a b c Harding 2013, p. 2. ^ Harding 2013, p. 5. ^ a b Harding 2013, pp. 11–13. ^ Harding 2013, pp. 21–22. ^ Piekałkiewicz, Janusz (1974). Secret Agents, Spies, and Saboteurs: Famous Undercover Missions of World War II. William Morrow. ^ Harding 2013, pp. 45–46. ^ Harding 2013, pp. 25–30. ^ Harding 2013, pp. 43–44. ^ Harding 2013, pp. 53–55. ^ Harding 2013, pp. 27–28. ^ Harding 2013, pp. 59–62. ^ Harding 2013, p. 57. ^ Harding 2013, pp. 36–37. ^ Harding 2013, pp. 72 and 181. ^ a b Mayer 1945. ^ Harding 2013, pp. 23–24. ^ Harding 2013, pp. 103–107. ^ Harding 2013, p. 96. ^ Harding 2013, p. 107. ^ Harding 2013, pp. 95–97. ^ Harding 2013, pp. 109–112. ^ Harding 2013, pp. 112–113. ^ Harding 2013, pp. 121–124. ^ Harding 2013, pp. 124–128. ^ Harding 2013, pp. 146–152. ^ Harding 2013, pp. 144. ^ Harding 2013, pp. 145. ^ a b Lateiner, Donald (March 21, 2014). "The Last Battle: When U.S. and German Soldiers Joined Forces in the Waning Hours of World War II in Europe". Michigan War Studies Review. Retrieved 26 September 2014. ^ Leon-Jouhaux, Prison pour hommes d'Etat, 157. ^ Harding 2013, pp. 157–161. ^ Harding 2013, p. 165. ^ Harding 2013, p. 150. ^ "World War II's Strangest Battle: When Americans and Germans Fought Together". The Daily Beast. 12 May 2013. Retrieved 26 August 2017. ^ Harding 2013, p. 169. ^ a b Roberts 2013. ^ "The Last Battle" – via www.imdb.com. ^ Jr, Mike Fleming (2017-01-25). "Peter Landesman To Helm 'The Last Battle' For Studiocanal And The Picture Company". Deadline. Retrieved 2017-10-21. ^ Sabaton. "The last battle - Lyrics | Sabaton – Official website and headquarters". Sabaton – Official website and headquarters. Retrieved 2017-09-29. ; Album review concerning The Last Stand on soundboardmagazine.com. ; Album review concerning The Last Stand on metalnexus.net. ^ "Castle Itter Kickstarter Entry". Retrieved 2018-11-30.